Territorians love their football and the arrival of the Parramatta Eels last week had the town abuzz. Playing against the Gold Coast Titans, the blue and gold army has been adopted as the Territory's own making annual visits as part of a $4 million deal struck in 2014. The four-year deal sees the Eels travel to Alice Springs each year for a pre-season match then later in the season to Darwin for a premiership match. Whilst in town, the Eels' visit schools where they talk to students about wellbeing, the hospital where they visit sick and injured children who may not be able to make it to the game as well as hosting coaching clinics with junior rugby league players. The team's long-term contribution to the Territory comes in the form of the Northern Territory Institute of Sport Eels Academy. Young players with potential are identified through the Institute's program to take part in the Academy. The community turned out at a special training session on the Wednesday to meet the players with their visit culminating in a well-supported game of fast, action-packed league on Saturday night. 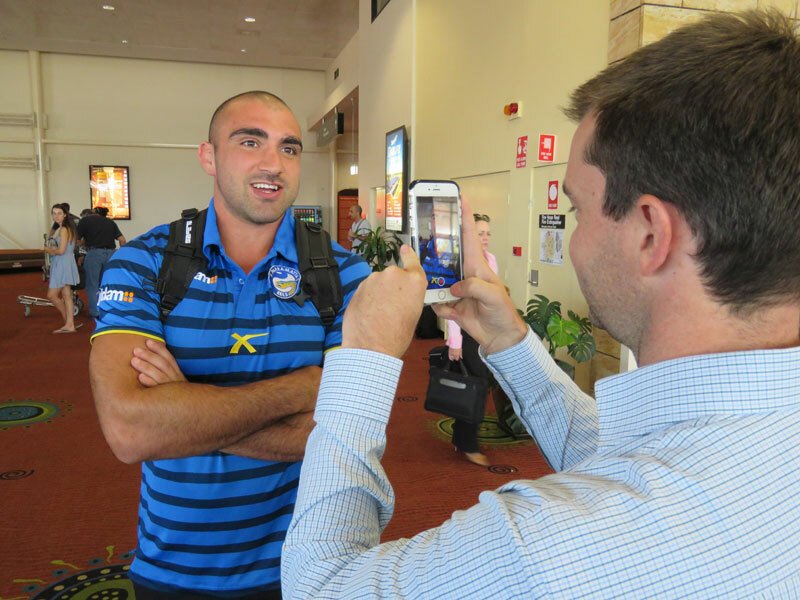 Tim Mannah from the Parramatta Eels arrives in Alice Springs.